I love, love, love finding items that serve more than one purpose. This is especially great for those living a green lifestyle. 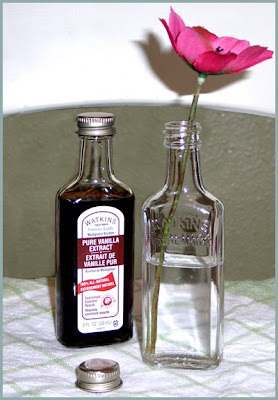 My latest find is Watkins Pure Vanilla extract. (I found it at Walmart for about $4). It comes in this adorable, four-inch tall, vintage-like glass bottle. When you've used up all the delicious contents, instead of tossing the bottle in the trash or recycling bin - use it as a sweet little bud vase! They make an even bigger statement when several of them are grouped together! Could you see five of these little babies lined up on a sun-drenched window sill? What items do double-duty in your home or garden? What a cute idea, Jen! (Watkins has a bunch of other relly great products with super cute packaging that I'd love to use in the same way too! You can find them at watkinsonline.com). Are you Immune to your Home's Eyesores?